Spacelabs 91393 Xprezzon® is a high acuity modular monitor suited for adult, pediatric, and neonatal. care, and as well as the perioperative environment. Xprezzon features a variety of configurations to fit the unique space and needs of your clinical environment. The Xprezzon provides easy access to patient data, creating information at the point of care for the clinician. 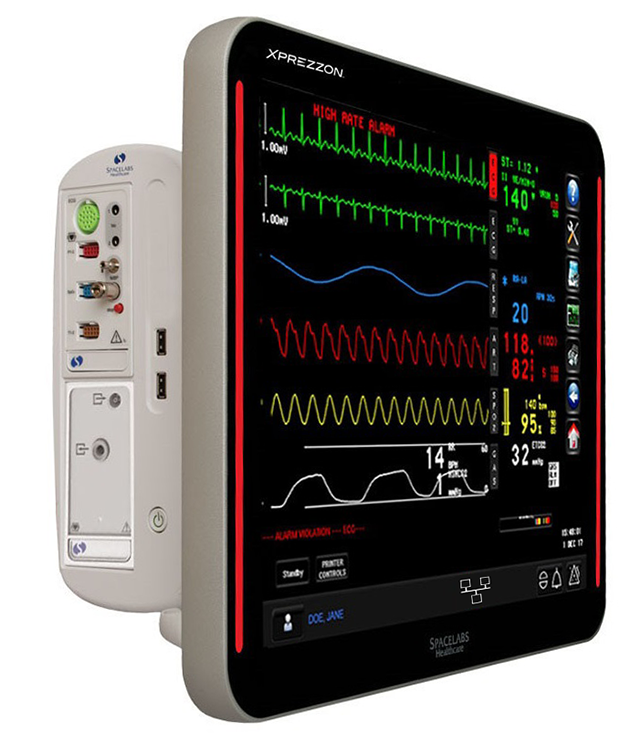 The optional dual-display allows a dedicated full screen view of physiologic information plus a secondary screen for an alternative presentation of the patient’s clinical data. A modern and innovative design provides an appealing and comfortable experience for both patients and their families. The sleek, frameless display makes cleaning easier to minimize the risk of infection. Ergonomic and versatile mounting solutions enhance the overall appearance of the care environment. Various solutions for both monitor and cable management ensure a more organized and efficient workflow at the bedside. The sleek, frameless display integrates highly visible LED alarm lights. These illuminate in the front and rear, enhancing the clinician’s ability to identify which monitor is alarming in the busy care environment. Xprezzon is also sensitive to a patient’s need for a good night’s rest, intuitively dimming the display in low ambient light. A high-resolution screen displays crisp and visually rich Custom Trends which enable faster and better informed patient assessment. With a single touch, clinicians can access different trend views based on observation needs, type of procedure, or clinical protocols. Trends can be displayed continuously for real-time updates of critical patient information. They can also be sized and arranged as preferred, providing clinicians with their own uniquely customized views. Your patient’s information in the palm of your hand. Whether inside the hospital or on the go, clinicians can stay connected with their patients. Spacelabs’ innovative ICS provides the ultimate freedom and confidence – access to retrospective patient information on a clinician’s mobile device. and navigation. Xprezzon’s backward compatibility presents a seamless transition between platforms to complement your investment in previous generations of Spacelabs patient monitoring and information systems.